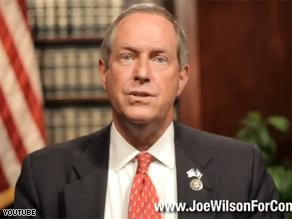 (CNN) - Less than a day after Rep. Joe Wilson formally apologized to President Obama over his "you lie" outburst, a campaign aide confirms to CNN the South Carolina Republican has raised "more than $200,000" in the wake of the now-infamous moment. "On these issues, I will not be muzzled, I will speak up and speak loudly against this risky plan," Wilson said in a YouTube video released Thursday evening. "The supporters of the government takeover of health care and the liberals who want to give health care to illegals are using my opposition as an excuse to distract from the critical questions being raised about this poorly conceived plan." The congressman disbursed the video via Twitter and asked his followers to "please watch and pass on." "[Democrats] want to silence anyone who speaks out against it," Wilson also says in the video. "They made it clear they want to defeat me and pass the plan. I need your help now... contribute to my effort to defeat the proponents of government-run health care." Wilson also sent a fundraising appeal via e-mail, saying he is confident "my voice is serving as the voice for Americans across the country who are tired of irresponsible government programs that have only worsened our situation." The appeal for cash came as Wilson's Democratic opponent in next year's congressional race, Rob Miller, reported raking in $750,000 as a result of the outburst during President Obama's address to a joint session of Congress. Miller ran against Wilson last year, losing by eight points. It was Wilson's smallest margin of victory in his five elections for Congress. In an e-mail to supporters Thursday night, Miller said he is aiming to top over $1 million in the next 24 hours, a total that dwarfs the $67,000 he has took in during the entire first half of the year. Wilson is sick! ... and what does it say about his supporters? After Googling Fact Check sites, I have found that Joe Wilson is twisting the facts on the WH healthcare plan and illegal immigrants. Please check for yourselves before trashing the President's plan. I ma glad these idiots were voted out. He is also a known racist. i wonder whether is's coincidence that they all in the repub party. This guys a complete and utter fool!!! He's not at all apologetic or remorseful for the disgrace exhibited the other night at the capitol! He should be punished for this disgrace! This guy graduated from college? Law school? Come on ...let's see his degree...some qualifications for the job. His behavior would lead one to question his upbringing, maturity, and concern for the office he holds. Way to go Joe! You really helped the Republican cause. And as for "serving as the voice for Americans across the country", he is there to represent the people of South Carolina. Period. I have my own representative thank you very much. He says he "will not be muzzled". Yeah, we noticed that he needed a MUZZLE during Obama's speech. A predictable response to his begging video is, of course, "You lie!" His three kids and he himself gets free healthcare...hypocrisy abounds! Ah yes...he said he's sorry....but not really. Just like Palin, I guess...a real "whak job"
Hypocrisy at its best !!!! Now everyone saw what Republicans truly stand for. I wonder if Wilson's reaction would have been the same if it a white man had been delivering the speech. Something to think about. It has been such an embarrising affair that proves lack of respect for the US Government. oh gee now isn't that such gracious behavior after his apology. and the right wingers wonder why they lost the election. Thanks to Keith Olbermann ( in his special comment segment last night) for exposing this anti Obama idiot for who he really is. He should be sanctioned. He is a disgrace and will loose his re-election bid. Believe that! Low life scum looking out for big business that pads his pocket. Wow, that's a whole lot of whining from somebody who was such a tough guy on Tuesday night. Who said anything about silencing this loser? We just want you to act your age-not like a spoiled toddler who hasn't been properly taught to show respect to the adults in charge. Good to see that he still hasn't actually read the bill. Illegal aliens are NOT covered. Ah, GOP, you kill me. After Wilson's predecessor Preston Brooks beat Charles Sumner into unconsciousness on the Senate floor with his cane, people from all over the South sent him canes. Seems like they're at the same thing again. Joe's about to find out how much better it feels to NOT have government provided health insurance. Whoever donated cash to this guy's campaign is just as low as he is. What a waste of space.